No PR, but best 50K yet! 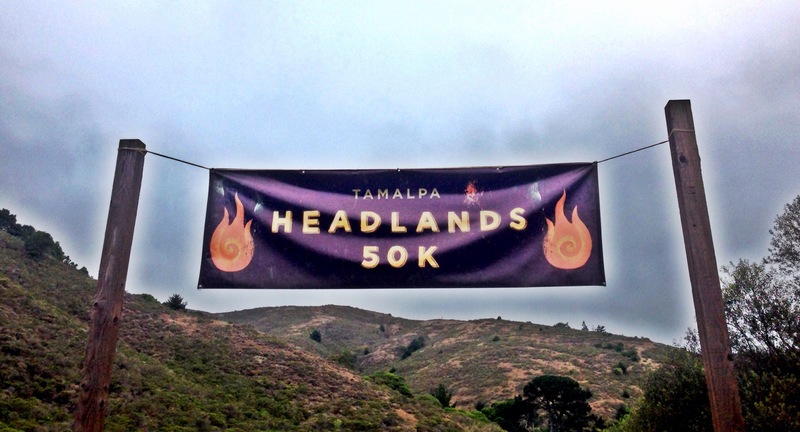 On August 23rd, I ran the Headlands 50K, which is put on by the Tamlpa Runners club. This event only has the single distance, so it draws fewer participants than some of the other runs in the area. It does have a limit on the number of runners and did have a wait list when I checked the website the week before the race, so it is a popular one. Weather. My Garmin showed 59 degrees at the start and there was a nice cloud cover. That was pretty much the weather for most of my run, though it did seem to warm up after mile 20 and the cloud cover burned off for good by mile 26. My cheat sheet that I had on my iPhone…just in case. Course. Beautiful and challenging! 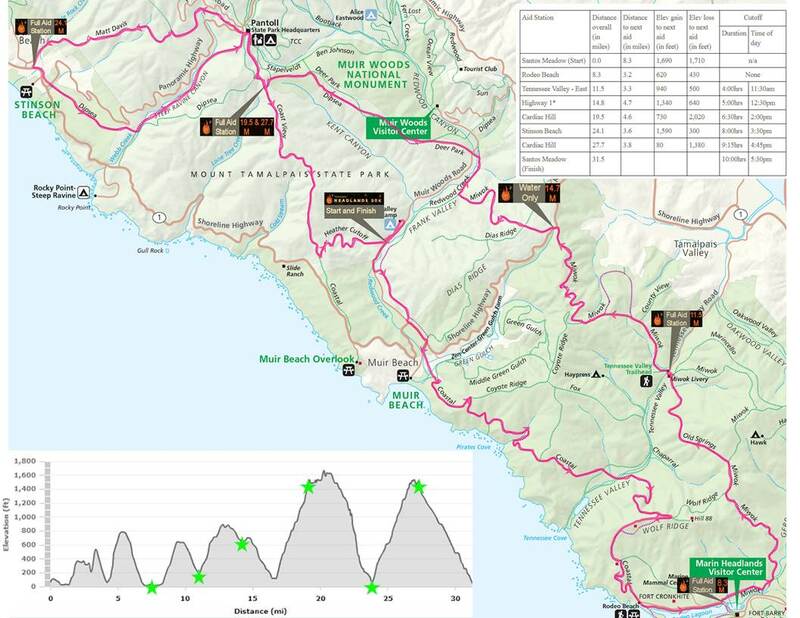 The Headlands 50K course is a tour of most of the notable trails in the Marin Headlands: Coastal, Miwok, Matt Davis, Dipsea, Steep Ravine, Coast View, and the Heather Cutoff. The combination single-track/fire road course takes runners through hills, valleys, ridges that have awesome views of the Pacific as well as redwood rainforest-type conditions – all with ~7,300′ total elevation change (though my GPS said 6,476′.) Again, it is an amazingly scenic course – I can only imagine how much more beautiful it would be without California being in a drought. Management/Support. SUPERIOR! I recently read a blog post that mentioned the significant differences between course management/aid stations at ultramarathons and bug-name events/races. This event was a prime example of how excellent things can be done with course management and aid stations. The event itself was extremely organized and managed well. Course markings and marshaling was spot on and aid station volunteers were up there with the best I have experienced in all races/runs I have participated in. There have been great volunteers at races – I have shared that in my past race reports – but this event somehow seemed a little bit above the others. The aid station fare was the standard for an ultra, but the aid station volunteers were proactive in making sure each runner was attended to and supported. WOW and THANK YOU! Finishers. In reviewing the results, there were 188 finishers – 136 men and 52 women. Post-Race. In addition to a great spread of typical, post-race fare (fruit, cookies, water, soda, beer, etc. ), all finishers enjoyed fresh, handmade pizza from Firetrail Pizza that was baked on site in their custom, wood-fired oven. It was excellent! I normally don’t partake of the post-race food, but it was hard to pass this up! I even chased my four pieces with a Sierra Nevada Pale Ale – hey, I’d just run 31 miles…i deserved it! Medal/Shirt. Each finisher received a medal and bag of SWAG. The medal was nice and the SWAG, which came in a branded, reusable bag, was pretty good as well. My favorite item was the event-logo’d, Barking Frogs headgear – as I am a Buff addict/collector. I’ll definitely be sporting this at upcoming races. As for the event shirt, the WESR (Wife’s Event Shirt Rating) is a 2.5/5. The color was basic (white) and the small logo on the front and sponsor’s names were nice and minimal. It was a Brooks shirt, but just “average” in the shirt department. Finish time: 7 hours. Given the elevation profile, I did not expect a PR, so I adjusted accordingly. Be intentional about fueling with Tailwind. Have fun – which is always a given! I got to the venue early, hung out in the car for a bit, then cruised to the outhouse and took care of business (love being the first user!) After checking in, I wandered about, went back to the car and put my kit on, then found a seat in the start area and chatted with a few runners. We started exactly at 0730 (gun start timing make that necessary) and I placed myself in the top half of the group. My intent was to get a decent position for the first section’s single track so I didn’t get too bogged down in the pack. I kept a slower pace all the same, knowing that I would pay for a “fast start” later in the day if I didn’t. I don’t really have a mile-by-mile recollection of the race – I just put it in gear when the RD said “RUN!” and kept the forward motion going. I fast-walked/ran the hills and ran the flats and downhills, keeping an eye on the pace, but really going by feel and effort. Again, keeping forward motion at all times. I pretty much zoned out and just went forward on most sections, though I did chat with a few people along the way. I paced/traded positions for most of the race with another guy wearing Altras, talking shoes periodically along the way – probably keeping our minds off the course as well. As I wrote above, the course was beautiful. I had never been to the Marin Headlands before (shame on me as a native to the Bay Area! ), but it lived up to all the posts I’d read about: scenic views, challenging hills, awesome single track, etc. I did shoot some pictures and probably would have shot more if this had been a training run – it’s that picturesque. For me, the most memorable and enjoyable section of the day was the descent down the Matt Davis Trail to the Stinson Beach aid. Don’t get me wrong, the other sections of the course were picturesque, but this was flat out FUN! This section was a challenging, yet runnable, downhill switchback, with roots, stairs, muddy conditions thrown in to make it interesting. Coming into it, I was running with two other people and paced with them most of the way. I passed the other guy in the group and ended up trailing/pacing a woman who was absolutely hammering the thing. I put it in gear and hammered it too – at least until I stutter-stepped and almost took a spill. I slowed for a few seconds, probably yelled “WHOA!” in my head, did a quick “systems” check, and resumed hammering the downhill. Reckless abandon! That said, the woman I was trailing was looong gone. It’s funny, as I reviewed the data from the run, I actually wasn’t going as fast as it felt I was; but the combo of the downhill, the short switchbacks, and technical/wet trail made it seem like it. I felt like a pro! The toughest parts of the day weren’t the Dipsea or Steep Ravine sections – which I thought would be in reviewing the course. They weren’t a cakewalk, but the toughest section was the final two miles, and especially the last mile, which was the Heather Cutoff switchbacks. Even though it was downhill, my legs were tiring and the final switchback section just seemed to slog on and on and on and on. The thing that kept me going was a runner that was a couple of switchbacks behind me. I could hear their footfalls and kept telling myself, “they are NOT going to pass me” repeatedly. And they didn’t. I crossed the finish line, got my medal, and walked to the car to drop my vest and clean up a bit. I walked around a little more to unwind and then headed back to the finish area to enjoy some food, sit for a while, and talk with some fellow runners. Finish time: 7 hours. I met this one, finishing in 6:33:39! I missed a PR by 1:47, but with this being a tougher course, I was completely satisfied with my results and the effort. Be intentional about fueling with Tailwind. I met this one. I think I have said before, I really love Tailwind Nutrition and it is working very well for me. That said, I had not been intentional about using as a source of fuel. In reviewing my use of it during races, I determined that I had been treating it as a drink only, sipping when I was thirsty instead of consuming as my single-source of fuel/nutrition. Going into to this race, I planned my consumption based on the aid station spacing and necessary caloric intake. I forced my self to stick with the plan, even polishing off the bottle a few times just ahead of the aid station, and things went great! My energy/endurance level was consistent and I felt great over the course of the race. Again, my legs were tiring at the end, but I don’t attribute that to my fueling – it was a 50K! I think I have settled on a good Tailwind/water ratio as well: 1.75 scoops to 16OZ of water. I used the Tailwind syrup thing that I tried on the Big Basin 50K again and it really worked well. This time, as I came into an aid station, I asked a volunteer to open my pack, hand me the TW syrup bottle, squirted a portion into my flask, asked them to replace the bottle in my pack, then had them top the bottle off with water. This worked fantastic and I don’t think I stayed at any given aid station any longer than two to three minutes…thanks to the excellent volunteers! Push myself a little more than usual. I met this one. I mentioned above that I just kept moving forward through the race. I really didn’t stop or slow for any extended period of time (including the aid stations), which I have done in the past. I just pushed myself onward, keeping the effort going at a consistent pace/rate/effort. Have fun! I met this one. As you can probably tell, this was a great race all around for me. It wasn’t a PR, but all in all, it was pretty dang fun and why I enjoy trail running so much. A bridge…followed by more stairs! Firetrail Pizza was soooo good! Fueling. I did my usual, pre 50K-race, carb loading/regimen: 36 hours of >80% carbs and +1100 calories above my normal day. Race-day fueling: Bagel with 2T peanut butter at -3 hours. During the race, I drank about 128 ounces of Tailwind Nutrition’s Mandarin Orange mix and about 24 ounces of water. I also grazed at two aid stations, eating some watermelon and bananas – and a couple of pretzel twists…which were so dry, that I choked on ’em and spit them out. Equipment/Kit [head to toe]: Buff visor, tech shirt from the 2012 San Jose Giants Race, Ultimate Direction Scott Jurek Ultra Vest (with 2 Hydrapak soft flasks,) Ultimate Direction 10oz bottle (for Tailwind syrup solution,) SPOT 3 GPS Tracker, Garmin 910XT, Road ID (Slim), Mio Link heart rate band, ASCIS 55 Shorts, CEP Compression Sleeves, Injinji Run 2.0 socks, Altra Olympus shoes. Bottom line: Fantastic day! Third 50K in the books. Not a PR, but my most satisfying 50K yet. I’m running three more 50Ks this year in the Headlands, so this was also a great opportunity to scout some of the trails that will be part of those runs. Post-race meal: Pizza and a beer at the race, followed by a pile of spaghetti after I got home and showered. Oh, and I chased it all later that evening with a big bowl of ice cream and chocolate sauce! *Six-word race report is something I read about in a blog post (that I can’t find now); but, according to a Goggle search, finds its origins in two things: a 2008 blog post I stumbled on, which based the challenge on the book “Not Quite What I Was Planning: Six-Word Memoirs by Writers Famous and Obscure”, by Rachel Fershleiser, published in 2006. Moving forward, I plan to include this in my reports as a challenge to succinctly synthesize my report…for those who are not interested in reading the oft-painful details!